Samsung’s ‘J’ series is now one of the best smartphone series by Samsung, and it is aimed at the budget price segment. The company has started a new trend for a couple of years by launching the same devices with a new design and features every year like the J7, J7 2016 and J7 2017. 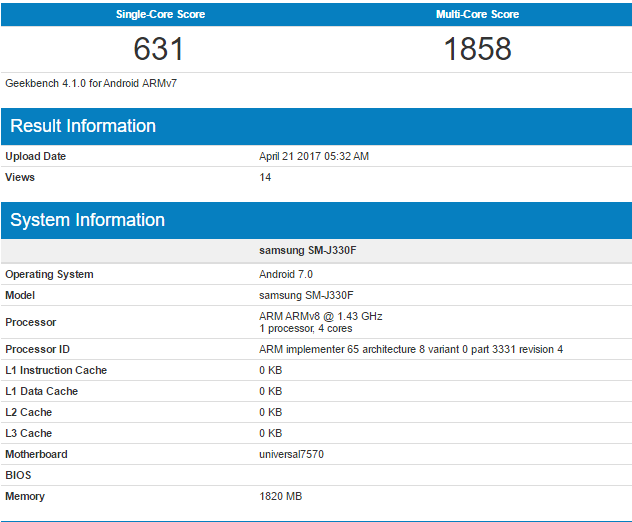 Today, a member of the ‘J’ series, the Galaxy J3 2017 has passed through the benchmarking platform, Geekbench. This has revealed a few details of the device like the processor, internal storage, and Android version. The phone has model number SM-J330F and is powered by the Exynos 7570 Quad-Core processor clocked at 1.43GHz. The device has got 2GB of RAM that shows that the price will be well under Rs.10,000 or $150. There is not much information about the phone like the design, display, battery, etc. but hopefully, these details will be revealed in coming days. Stay Tuned.